In 10 easily digestible modules, this course gives you a proven SEO strategy to grow your organic search traffic so you can reach new readers – readers who could turn into loyal fans that will join your mailing list, follow you on Facebook, and read everything you write. See the course syllabus and more here. 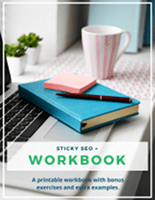 The cost of this course includes a printable workbook with bonus exercises and examples in a PDF format you can print.